Today was cold and wet and the first day back in gardening class. When I suggested that we might like to go outside to look at my vast selection of variegated plants (I have a bit of a thing about them…… I think they add fizz and pop to any planting scheme, and am unashamed about using them in every garden that I design) I was almost lynched, so instead, we hunkered down in the warmth of my kitchen for story time. 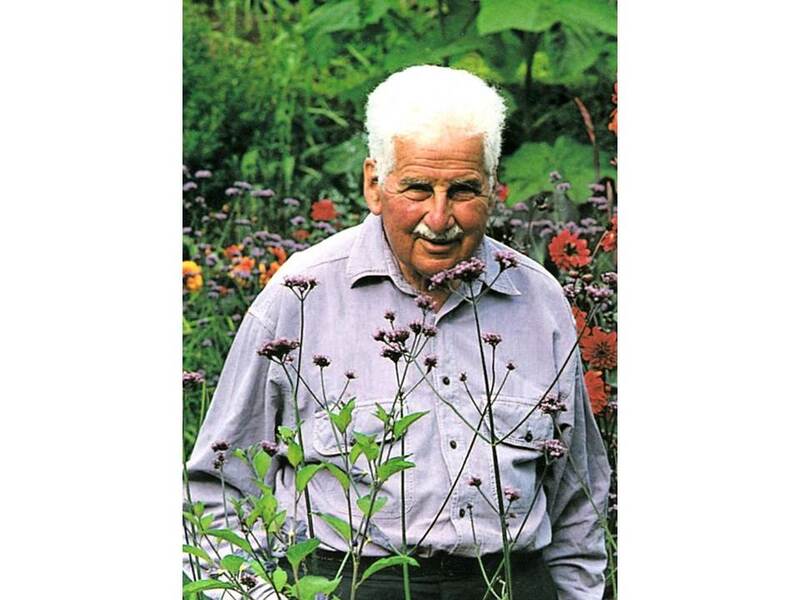 This week storytime was all about Christopher Lloyd of Great Dixter fame – that superlative garden located in Rye, designed by Edwin Lutyens and Christopher’s father Nathaniel Lloyd in 1910, but transformed by Christopher into the thing of beauty that it is today. Everyone in the class loves story time because there’s always more than a smattering of scandal about the gardens and gardeners that we cover each week. I’ve come to the conclusion that garden designers in particular are a rum lot (myself excluded of course!) but they provide ample fodder for a News of the World type expose which delights us all. The gardens at Great Dixter are beautiful and I once had the pleasure of going on a paid for private visit with my friend Deborah to be shown around by the great man himself, along with around 20 other paying guests. I was in awe, as were we all, and we trailed around after him listening as he pointed out the finer details of some of the planting schemes that he’d concocted with his head gardener Fergus Garrett. I was determined to to talk to this great man and when I found myself standing beside him and a slightly overgrown Phlomis fruticosa which looked just like mine at home I tremulously said ,”Christo ,could you tell me when is the right time to prune Phlomis?” Christo glared at me and snarled, “Thank you for pointing out that I haven’t pruned my Phlomis at the correct time! It should have been pruned two months ago- as you probably well know !” And he swept away. I didn’t try again. But his writing and the 5 acre gardens are marvellous. Christopher Lloyd was one of the first great gardeners to popularise the use of mixed borders where shrubs, bulbs and annuals are used in what had usually been perennial only borders. He also caused a huge furore in the gardening community by ripping out a rose garden that had been planted in Lutyen’s time and replacing it with a jungle garden- one of the first ever seen in this country. But it was only after his death aged 84 in 2006 that the most bizarre aspect of his life came to light. Stephen Anderton had been tasked with writing his official biography (Christopher Lloyd: His Life at Great Dixter by Stephen Anderton) and he found papers and letters which had been hidden away ,obviously never meaning to be revealed. He read them and decided that the story needed to be told of Christo’s relationship with his mother Daisy, also called by everyone who knew her ‘The Management’. Daisy was very proud of her antecedents, believing that she was a descendant of Cromwell, and deciding to celebrate this by dressing every day in a sort of Quaker period costume. She was also determined to see herself as the perfect mother with six perfect children, something which was far from the truth. In fact Stephen Anderton says that Christo’s life can be divided into two halves, life until he was 50 when his mother lived with him and controlled him, and life after 50 ,after The Management’s death, when he blossomed into a new-found freedom. Daisy’s control of her children started young, sending them all away to boarding school but writing to them frequently, including harsh criticisms in each letter as she said these were important to improve them. Even though little Christo was only nine years old and being bullied at school he had to keep all her secrets of how she hated so-and-so and felt her need for her husband physically etc. Daisy constantly criticised her poor daughter Leticia’s weight gain going so far as to employ a woman to follow her poor daughter around during the school holidays making sure she didn’t eat too much. When the unhappy Leticia lost two stone, her mother wrote to her saying it should have been four.She actually captioned this photo of Leticia and Christo with ‘The Amazon and the Pansy’. Daisy lived in the bedroom above the front porch so that she could monitor the comings and goings of anyone visiting the house or garden, and when she wasn’t there, she was sat in a chair in the front porch. Here she is. It was against this backdrop that Christopher lectured at Wye College and developed the garden but did not dare to come out as homosexual as he knew she would disapprove. Then Daisy died and 50-year-old Christo blossomed into happiness. He filled the house with friends aged from 20 to 80, paid to take a large group of his friends tickets to Glyndebourne every year, and cooked exquisite meals for them and opened copious bottles of champagne to wash it all down with. It’s a marvellous garden and I urge you to visit it if you haven’t already. But be warned, it’s a garden unlike any other. So don’t be like one of those garden visitors that Christo abhorred, the ones who said,on seeing the meadow in front of the house, “Oh is the owner dead? They’re obviously struggling to keep the grass cut.” What Christo replied cannot be repeated.